King David conquered the Jebusite Fort around 1000 BCE and, after moving in, called it "The City of David." The city was expanded by David and his son, Solomon, and later expanded by King Hezekiah around 700 BCE. Jerusalem flourished until the Babylonians destroyed it around 600 BCE. Nehemiah returned to Jerusalem around 450 BCE and rebuilt the wall and gates of the entire, expanded city. After Alexander the Great died in 323 BCE, the Ptolemaic leadership took Jerusalem and built up the area of the original City of David to house their troops. They added high towers to the northern end of their fort to keep an eye on the goings on in the Temple area. In the above photograph, you can see the silver Dome of the mosque which is located on the Temple Mount. This shows that the soldiers could observe the activities around the Temple from the top of these towers and other towers that existed on top of the ridge. Some of the Jewish scribes were sent to Egypt to translate the Hebrew Scriptures into the Greek language around 250 BCE and it was these scribes who first called the fort, Akra, when they translated II Samuel 5: 9. Mislead by Josephus, modern scholars have attempted to locate the ancient Seleucid Akra against the southern wall of the original Temple Mount or in some other similar location. The actual location of the Akra in the City of David, however, was given almost two hundred years before Josephus in the Book of I Maccabees. Notice (underlining ours): I Maccabees I. 33 Then builded they (the Seleucids) the City of David with a great and strong wall, and with mighty towers, and made it a stronghold (Gk. akpau Akra) for them.The Maccabean, Simon, later captured the fortification of the Akra from the soldiers of Antiochus as recorded in: I Maccabees XIV. 36, 37 For in his (Simon’s) time things prospered in his hands, so that the heathen were taken out of their country, and they also that were in the city of David in Jerusalem, who had made themselves a tower (Gk. akpav Akra), out of which they issued and polluted all about the sanctuary, and did much hurt in the holy place. …and the rest fled into the city of David. This shows that the entire City of David (nine acres) must have been controlled by the Seleucids who, through the Fountain Gate or Dung Gate in the south, allowed access to Nicanor’s soldiers into the Akra. Josephus, relying on tradition, erroneously conjectured that the Akra “was attached to and rose above the Temple in Jerusalem.” That, of course, is impossible for no political building was ever attached to the Temple. Some have thought that Josephus meant that the Akra was attached to the southern retaining wall, but that too is impossible. The Hasmoneans built their extension to the southern end of the original Temple Mount in 152 BC, before the Akra was razed by Simon in about 137 BCE. Note the Antiquities of the Jews Book XIII. Chapter VI Simon…took the citadel of Jerusalem by siege, and cast it down to the ground, that it might not be any more a place of refuge to their enemies… Inasmuch as the Akra was still standing after the Hasmoneans built their Temple Mount extension means that the Akra with its high towers overlooking the Temple had to be in a different location. That location was in the City of David as we have seen. In another place in his Antiquities of the Jews, Josephus mentions the Akra: Book XII. Ch. V He (King Antiochus IV) also burnt down the finest buildings; and when he had overthrown the city walls, he built a citadel in the lower part of the city, for the place was high, and overlooked the temple on which account he fortified it with high walls and towers, and put into it a garrison of Macedonians.Qedem 19, page 29 from the Hebrew University says that the hill of the City of David was the main part of the Lower City (“the lower part of the city”). The Akra (citadel, fort), then, would have occupied the City of David, adjacent to the Temple Mount. It was here that Antiochus IV rebuilt the citadel that his father, Antiochus III the Great, captured from the Ptolemies of Egypt. The southern end of their eastern wall (W 151-152 from Dr. Shiloh’s excavation), built on bedrock, still remains in Area D1 on top of the ridge as part of the City of David Archaeological Park. Dr. Shiloh confirmed the dating of W 151-152 to the Hellenistic period (Seleucid) by the chalky limestone chips, refuse from a quarry of the Persian period, found under the wall (Qedem 19, page 8). The northern end of the City of David Archaeological Park also has traces of the same upper ridge wall (W 309) and the remnants of two towers (southern, W 310, and northern, W 308) on each side of the Stepped Stone Structure. Fortunately for us, when the Hellenists finished their construction, they covered the foundations on the hillside with a 10’ to 13’ thick glacis of earth and gravel that sealed the surface of the slope and made it difficult for the enemy to ascend. "In the second year of Darius the king, in the sixth month, in the first day of the month, came the word of the Lord by Haggai the prophet unto Zerubbabel the son of Shealtiel, governor of Judah, and to Joshua the son of Josedech, the high priest, saying, Thus speaketh the Lord of hosts, saying, This people say, The time is not come, the time that the Lord's house should be built. Then came the word of the Lord by Haggai the prophet, saying, Is it time for you, O ye, to dwell in your cieled houses, and this house lie waste? Now therefore thus saith the Lord of hosts; Consider your ways." The Hellenists later reinforced the tower and restored the citadel, adding their own high towers that overlooked the Temple to the north. The comparatively rounded stones used in the construction of the wall, with its two towers, also prove that the Hasmoneans could not have been the builders because they used squared stones with a prominent boss in their constructions. Note the Antiquities of the Jews by Josephus: Book XIII,Chapter II I (King Demetrius) also give you leave to repair and rebuild your temple, and that all be done at my expense. I also allow you to build the walls of your city, and to erect high towers, and that they be erected at my charge.…thus did Jonathan make his abode at Jerusalem…he gave orders that the walls of the city should be rebuilt with square stones, that it might be more secure from their enemies. Book XIII. Chapter VI …they…leveled the mountain, and in that work spent both day and night without intermission, which cost them three whole years, before, it was removed, and brought to an entire level with the plain of the rest of the city.The recent excavations above the Stepped Stone Structure show that this statement has been fulfilled. The huge fortification with its gigantic walls and tall towers is completely gone. It is entirely “level with the plain of the rest of the city.” Today the visitor can only look down at the Jebusite olive oil production depressions and other ancient installations carved from the bedrock. If the Hellenists had not covered the Stepped Stone Structure and the bases of the two towers with a thick earthen glacis, we would have no visible evidence today of the fortifications that once occupied this location. When I first arrived to dig in the City of David, I was assigned to Dr. Shiloh’s Area D2, just south of the ridge where the Akra once stood. There we found two coins (one from 40-37 BCE and another from 37-4 BCE). A coin from 49 BCE was found in Area E1 near the Stepped Stone Structure. It depicts the head of Zeus. Also found there was a fragment of decorated ivory depicting Zeus. Of far more importance were the multitude of coins of the Hellenistic period found in the City of David. Discovered here were 135 coins of the Hellenistic period. 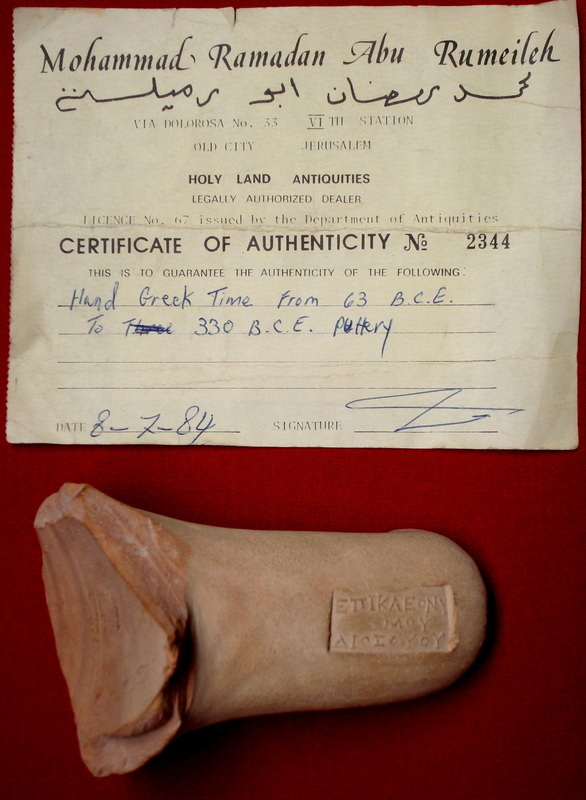 One day while excavating near the bottom of Hezekiah’s mid-slope wall in Area D2, I discovered a handle from a large storage jar dating to the eighth century BCE, the time of Hezekiah. I continued digging along the wall until I reached bedrock. It was this wall of Hezekiah that Nehemiah later repaired. Thirty-five times in Nehemiah chapter three we are told that Nehemiah “repaired” the wall. He did not build a new wall of his own on top of the ridge. As I was admiring the handle at the foot of Hezekiah’s wall, someone yelled, “Inscription!” Everyone gathered around to witness the new discovery. 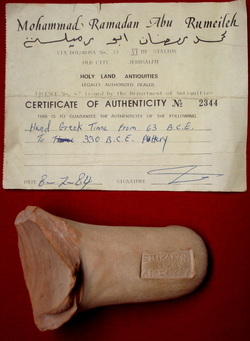 It turned out to be a stamped Rhodian jar handle from the time of the Seleucid occupation of the Akra in the City of David. 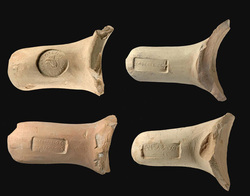 The discovery of huge amounts of these Hellenistic stamped Rhodian jar handles in the City of David excavations emphasizes the Seleucid presence in that part of Jerusalem during the Hellenistic period (331-37 BCE). No less that 450 stamped handles were found dating between those dates, 267 of them dating to the time of Antiochus III and his son, Antiochus IV Epiphanes. This multitude of coins and stamped Rhodian handles of the Hellenistic period found in areas D through G, beneath the eastern ridge of the City of David, testify to the presence of the Seleucids in the City of David. Book XII Ch. III Now it happened that in the reign of Antiochus the Great…the Jews, of their own accord, went over to him, and received him into the city and…readily assisted him when he besieged the garrison which was in the citadel of Jerusalem. It was during this period that the Greek Septuagint translation of the Hebrew Old Testament was written. The Antiquities of the Jews states that King Ptolemy II Philadelphus ordered the High Priest in Jerusalem to send him six elders from each of the twelve tribes of Israel to make the translation. Eleazar, the High Priest, thereupon sent seventy-two scholars who were totally familiar with Jerusalem in general and the hated Akra in particular. II Samuel 5:9 And David dwelt in the hold, and it was called the city of David, and he built the city itself round about from the citadel (Gk. akpau Akra), and he built his own house. Our conclusion can be none other than that the elusive Akra was built on the original site of the City of David with its towers overlooking the Temple Mount as described twice in the book of I Maccabees and once in the Septuagint. This picture was taken from the southern wall of the Temple Mount. 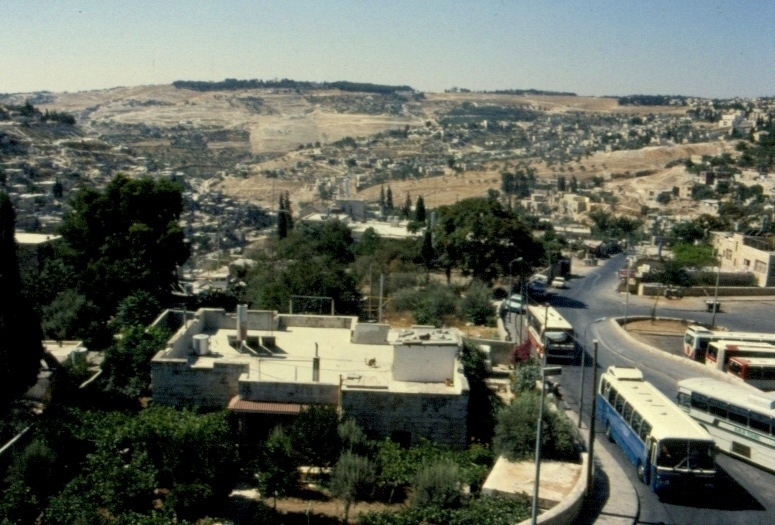 The City of David lies before us with the Kidron Valley on the left (behind the trees) and the Tyropoeon Valley (marked by the road) on the right. The northern end of the imposing Akra, with its high towers, covered this area between the trees and the Giv'ati Parking Lot (lower right) which contained abundant Hellenistic remains when it was later excavated. 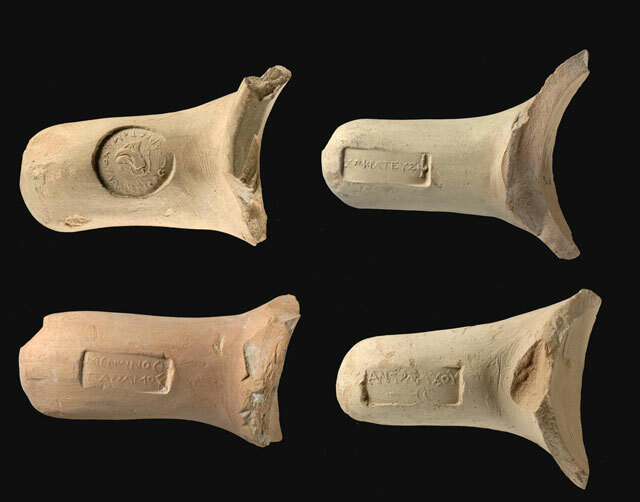 22 of these Hellenistic stamped handles were found in the Giv'ati Parking Lot Excavations in 2008. The location of the parking lot is just slightly west of the Stepped-Stone Structure. 267 of these stamped handles, dating to the time of Antiochus III and his son Antiochus Epiphanes were found in the city of David. In 1984 I entered a small shop in Jerusalem's Old City and asked the young boy inside if he had any ancient artifacts that contained an inscription. He disappeared behind a curtain in the back of the shop and came back out with his grandfather who was holding an amphorae handle that was stamped with Greek letters. I remembered seeing an almost identical handle found by a fellow volunteer earlier that week in the City of David excavations. This is further proof of the Hellenstic presence in Jerusalem around 200 BCE. Hasmonean squared-stones on the right with their characteristic margins and raised boss. In contrast are the Herodian stones on the left used in Herod's southern extension of the Temple Mount. 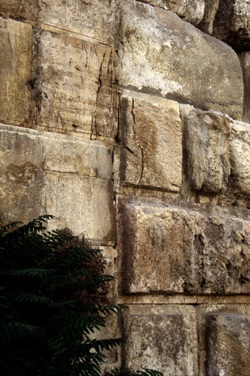 This "seam" can be found on the eastern wall between the East Gate and the southeastern corner of the Temple Mount. 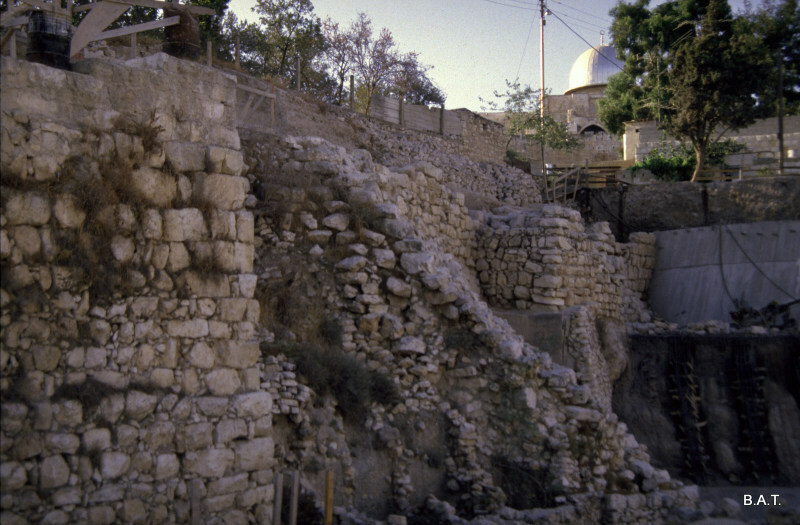 Archaeologists of the Israel Antiquities Authority believe that sections of a fortification recently discovered in the Givati parking lot excavations at the City of David, in the Jerusalem Walls National Park, were part of the defenses constructed atop the City of David hill during the reign of Antiochus Epiphanes (215-164 BCE). In addition, sling stones, arrowheads and ballistae stones that are evidence of the Hasmonean attempts to conquer the stronghold were also revealed. Park, apparently led to solving one of Jerusalem’s greatest archaeological mysteries: the question of the location of the Greek (Seleucid) Acra – the famous stronghold built by Antiochus IV in order to control Jerusalem and monitor activity in the Temple which was eventually liberated by the Hasmoneans from Greek rule. Over the past 100 years of archaeological research in Jerusalem numerous theories have been put forth identifying the location of the Acra, The uncertainty stemmed from the paucity of architectural remains that can be traced to the Greek presence in Jerusalem. Both the Book of Maccabees, as well as the historian Josephus Flavius, located the Acra within the City of David. In recent months, excavators believe that they have exposed evidence of the Acra citadel on the City of David hill: a section of a massive wall, a base of a tower of impressive dimensions (width c. 4 m, length c. 20 m) and a glacis. The glacis, which was built next to the wall, is a defensive sloping embankment composed of layers of soil, stone and plaster, designed to keep attackers away from the base of the wall. This embankment extended as far down as the bottom of the Tyropoeon –the valley that bisected the city in antiquity and constituted an additional obstacle in the citadel’s defenses. Lead sling shots, bronze arrowheads and ballistae stones discovered at the site are the silent remains of battles that were waged there at the time of the Hasmoneans, in their attempt to conquer the citadel which was viewed as a ‘thorn in the flesh’ of the city. Historical sources state the stronghold was occupied by mercenaries and Hellenized Jews and tell of the suffering Jerusalem’s residents were exposed to at the hands of the Acra’s inhabitants. The fortification’s mighty defenses withstood all attempts at conquering it, and it was only in 141 BCE, after a prolonged siege and the starvation of the Greek garrison within the Acra that Simon Maccabeus was able to force its surrender. According to archaeologists, Dr. Doron Ben-Ami, Yana Tchekhanovets and Salome Cohen, excavation directors on behalf of the Israel Antiquities Authority, the Acra is "a sensational discovery that allows us for the first time to reconstruct the layout of the settlement in the city, on the eve of the Maccabean uprising in 167 BCE. The new archaeological finds indicate the establishment of a well-fortified stronghold that was constructed on the high bedrock cliff overlooking the steep slopes of the City of David hill. This stronghold controlled all means of approach to the Temple atop the Temple Mount, and cut the Temple off from the southern parts of the city. The numerous coins ranging in date from the reign of Antiochus IV to that of Antiochus VII and the large number of wine jars (amphorae) that were imported from the Aegean region to Jerusalem, which were discovered at the site, provide evidence of the citadel’s chronology, as well as the non-Jewish identity of its inhabitants”.